Made of high quality micro-suede fabric,PVC free and waterproof you don't worry about your dog has the issue in claws and drool to your car door. Each cover has 3 magic sticker tapes and 3 removable tabs on the top, and there are two options to install the cover. Easy to clean - machine washable, wipe with a damp cloth. Hang to air dry. 2. Remove the tabs and simply stick the magic sticker taps to the car door interior next to the window. 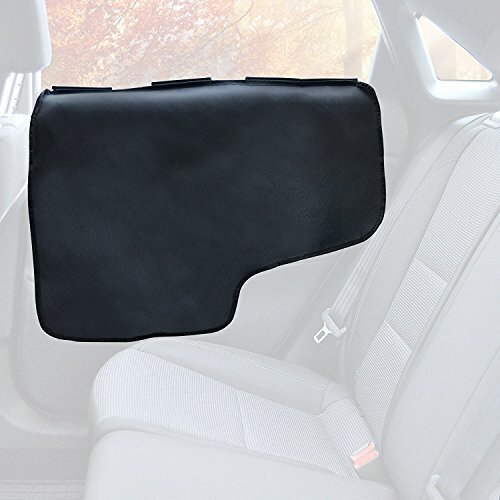 【Perfect for New Cars】 Protectors designed to guard brand new vehicles door from dog hair/dander/drool and scratches, while allow your Pet to still rest on the arm rest. 【Easy to Install】 Two options to install, either insert the tabs between your window and car door panel, or use the sticky back magic sticker tapes. Choose the best option to fit your car. 【 Quick Clean up】 Whole pet car door cover are easy to clean off with a damp cloth or machine wash, also can brush off the dirt once it is dried. 【 2 Set】Includes 2 covers, one for the left door and one for the right. 28'' Width X211.6'' Height, one size fits all. 【Flexible】 Flexible plastic insert for each door. Made with flexible yet Durable plastic will not scratch or leave marks on your car Window. If you have any questions about this product by ASOCEA, contact us by completing and submitting the form below. If you are looking for a specif part number, please include it with your message.